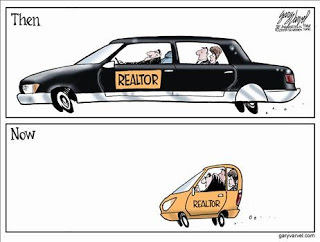 How's your real estate agent/broker doing? Hopefully I am your real estate broker! A client emailed me this picture and I thought it was pretty funny. I have spoken with several friends and colleagues in the business and like the rest of the economy, real estate has been slow. We certainly didn't start the first quarter of 2009 well, but the last 3-4 weeks have been extremely busy. The market typically picks up this time as we come into the spring market. The $8,000 first time home buyer credit helps also. Yesterday I actually had a bidding war for a single family home in Quincy. My client ended up paying a few thousand dollars over asking price, but it was a great house that was priced below market value. Last updated April 25 at 12:21 am.